Sir Henry William Paget, 1st Marquess of Anglesey, 2nd Earl of Uxbridge, KG GCB GCH PC, 1768-1854. British Field Marshal. Autograph Letter Signed, Uxbridge, one page, 7¼" x 9", Southampton, July 4, 1813. With mixed emotions, Paget thanks his correspondent for news of the allies' decisive victory over the French at the Battle of Vitoria, Spain—the battle that led to the collapse of Napoleonic rule in Spain, but in which Paget's brother-in-law, Colonel Cadogan of the 71st Light Infantry Regiment, was killed. 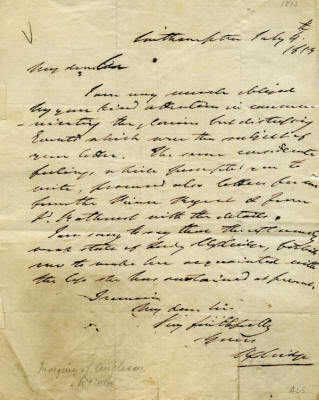 In full: “I am very much obliged by your kind attention in communicating the glorious but disturbing events which were the subject of your letter. The same considerate feelings which prompted you to write, procured also letters for me from the Prince Regent [later King George IV] and from Lord Bathurst with the details. / I am very sorry to say that the extremely weak state of Lady Uxbridge, forbids me to make her acquainted with the loss she has sustained at present." At Vitoria on June 21, 1813, an allied British, Portuguese, and Spanish army under the command of Sir Arthur Wellesley, the Duke of Wellington, defeated French forces under Joseph Bonaparte and Marshal Jean-Baptiste Jourdan. The victory led to eventual allied victory in the Peninsular War. Wellington attacked in four columns. Sir Thomas Picton's 3rd Division broke the French center, and soon the French defenses crumbled. 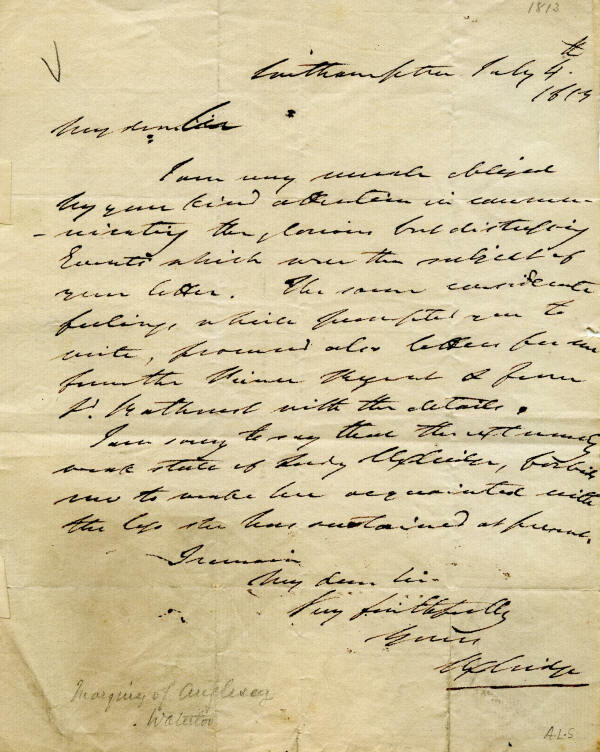 Click here to see a superb war-content letter of Picton that we also sold. Paget, who is chiefly known for leading the charge of the British heavy cavalry against d'Erlon's column during the Battle of Waterloo, had been out of action in the Peninsular War since 1808. His affair with Wellington's sister-in-law made service with Wellington impracticable. But he later married her upon her divorce from Henry Wellesley, Wellington's brother, and he returned to service under Wellington. In 1815, he was appointed a cavalry commander in Belgium, under Wellington's still resentful eye. Wellington gave him command of the entire allied cavalry and horse artillery on the eve of Waterloo, and on June 18, 1815, he led the spectacular charge of the British center, in part routing d'Erlon's troops. Toward the end of the day, however, Paget was hit with a cannon shot, which necessitated the amputation of his leg. According to legend, he was close to Wellington when he was hit. "By God, sir, I've lost my leg!" he exclaimed, to which Wellington replied, "By God, sir, so you have!" Paget has penned this letter in black. The integral leaf has been removed.  The letter has usual horizontal and vertical folds, tiny paper loss in a spot at the right edge not affecting the text, pencil notations, and mounting remnants and some soiling. It is in good to fine condition.